This is a multi-purpose hose designed for suction and discharge applications. 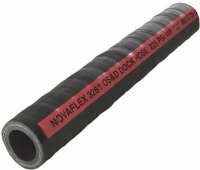 This dock hose is highly flexible and has an all weather cover which is resistant to oil, cuts, abrasion and gouges. The tube is resistant to petroleum products with aromatic content to 50%. Meets all US Coast Guard requirements for Dock/O.S. & D. hose.